This weekend is promising to be a HUGE white out snow storm. I really want to go into the city Sunday but I keep hearing that the snow is going to start sometime tomorrow and end after 6 on Sunday. YIKES!!!! SOOOOOOO....I thought I would give you an easy treat to make during these next long snowy days. 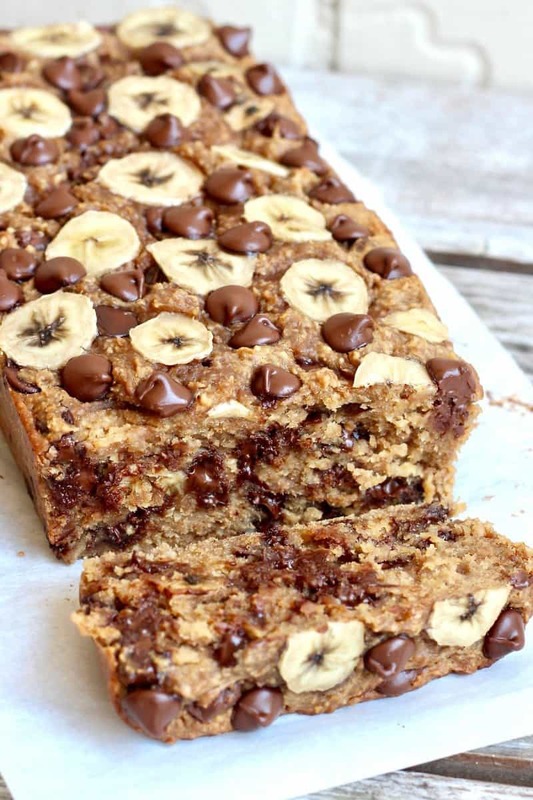 This Banana Bread is AWESOME. Its so easy to make and really really good. Plus with no flour and no added sugar you can help yourself to 2 slices!!! Bon Appetit!!!! Preheat oven to 350°F. Lightly grease 9x5-inch loaf pan with non-stick cooking spray. Add the bananas, oats and peanut butter to a blender (I use a hand blender) and blend until smooth. Try not to over blend the batter as this will lead to a denser loaf. Blend just until the oats are ground. Stir in the chocolate chips. (if the batter gets too thick add 1/4 cup water). Let bread cool completely in loaf pan.